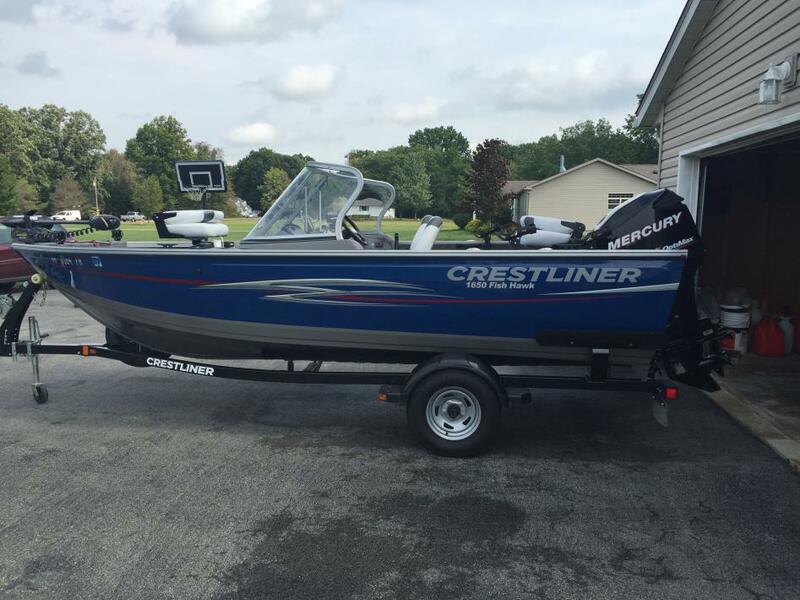 2017 Crestliner Fish Hawk 1650 WT 1650 Fish Hawk Walk Through powered by a 90hp Mercury 4 Stroke EFI. From the spacious casting deck and cockpit to the ample storage and livewells the Fish Hawk models have a lot to offer. 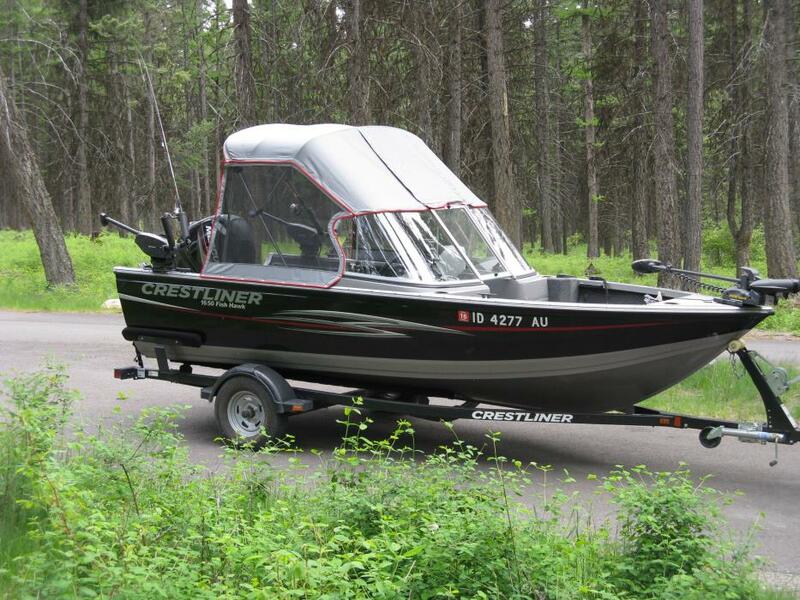 With the walk through windshield to help keep you out of the weather and keep you fishing and the 4 Stroke engine with hours of reliability this model is for you. 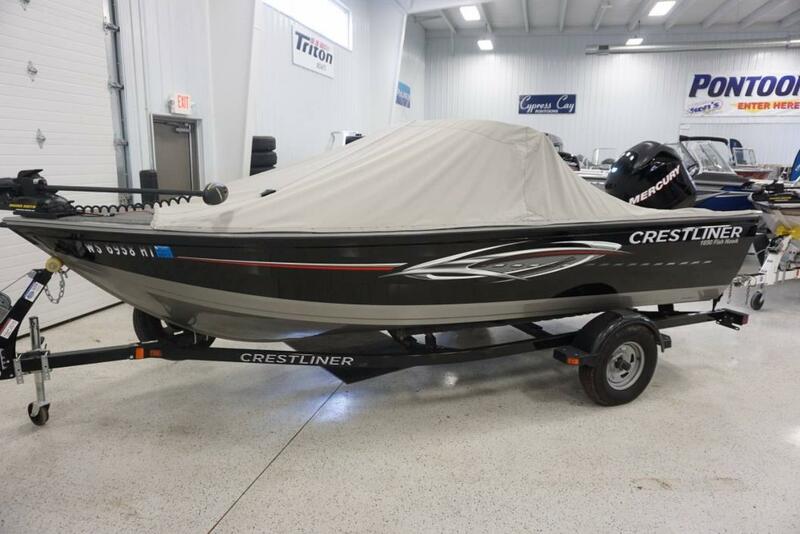 Some options included are: Spare Tire w/ Bracket, Load Guides, Extra Seat, Conversion Stern, Platinum Edition, 25" Transom, Fire Ext, 2 Under Console Drawers, Boss Stereo, Travel Cover, and More! Stop in today or contact us for more information on this model or on any of our in stock models that may be for you! 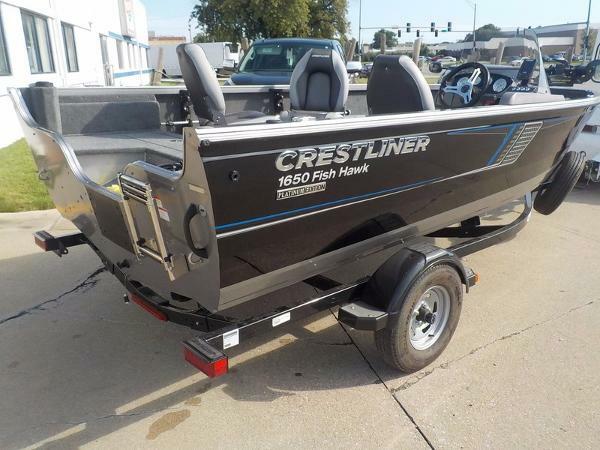 2011 Crestliner Fish Hawk 1650 THIS USED BOAT PACKAGE INCLUDES: 2011 CRESTLINER 1650 FISHHAWK WT, MERCURY 90 ELPT 4STROKE, SHORELANDR CRV22L BUNK TRAILER, MINNKOTA 55PDV2 TROLLING MOTOR, LOWRANCE ELITE 5X, COVER, SUN TOP WITH SIDES, 4 DLX SEAT, SPARE TIRE AND MOUNT, DEEP CYCLE AND STARTING BATTERIES. CALL MARINE SALES FOR YOUR BEST DEAL 920-788-0220. The Fish Hawk was born to fish with a rugged combination of Crestliner's legendary welded construction, open and versatile deck designs, smart storage solutions and unmatched stability and performance. 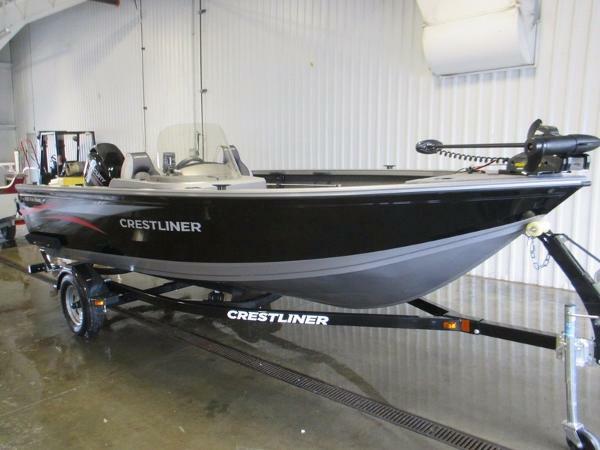 This ultimate family fishing boat also features a conversion stern bench. 2014 Crestliner Fish Hawk 1650 2014 Crestliner 1650 Fish Hawk Trailer 90 HP Mercury EFI 4 stroke Clean boat. 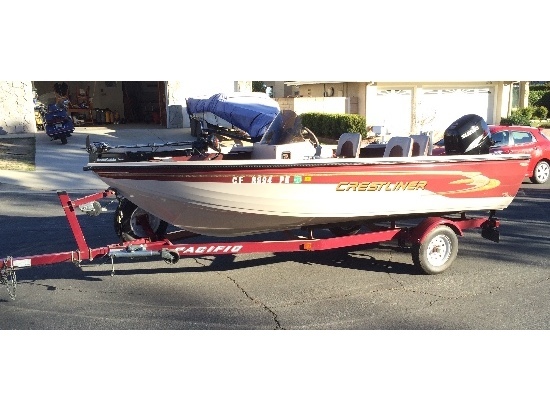 Great fishing and family boat. Just arrived. 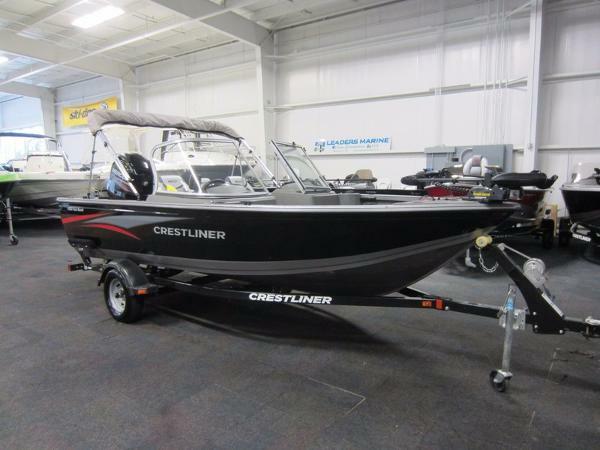 2017 Crestliner Fish Hawk 1650 SC JUST ARRIVED! 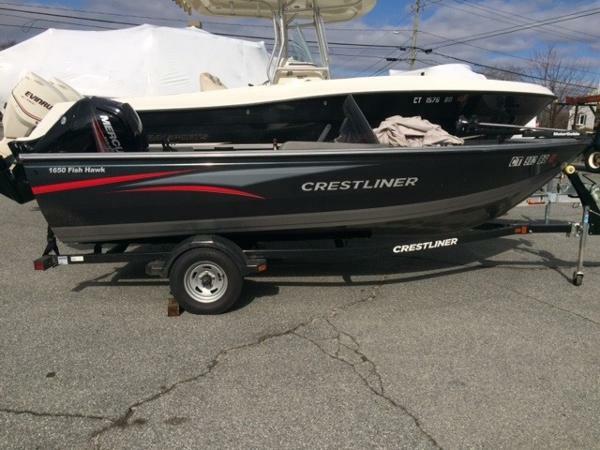 2017 Crestliner Fish Hawk 1650 SC 2017 Crestliner Fishhawk 1650Sc with Mercury four stroke 60hp EFI and matching single axle bunk trailer with swing tongue and spare tire. 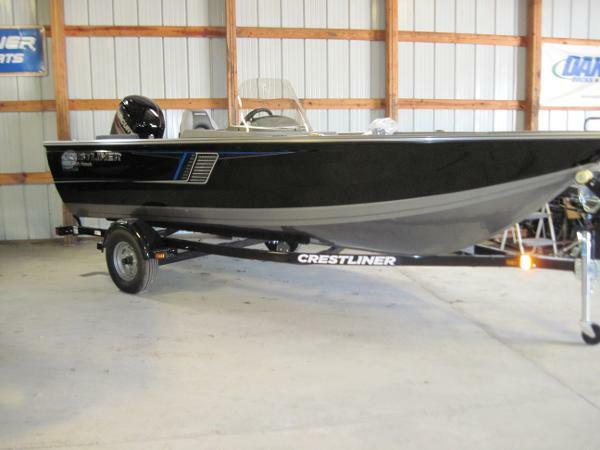 Package includes 3 deluxe seats, Platinum Edition options, Minn Kota 55lb /12v trolling motor. 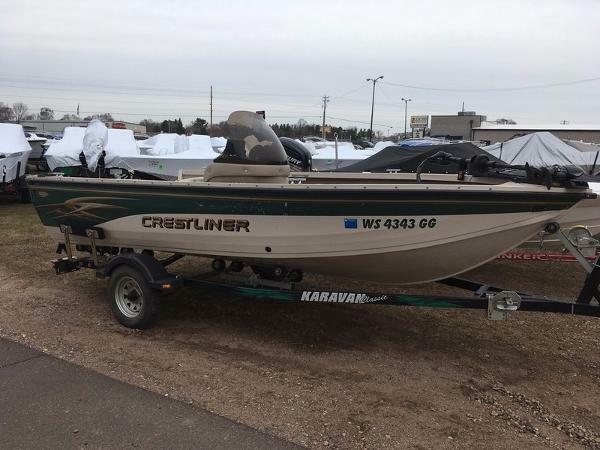 fish finder, livewell, bow cargo nets, vinyl cockpit floor, custom factory travel cover, Suremount accessory barcket with rodholder. 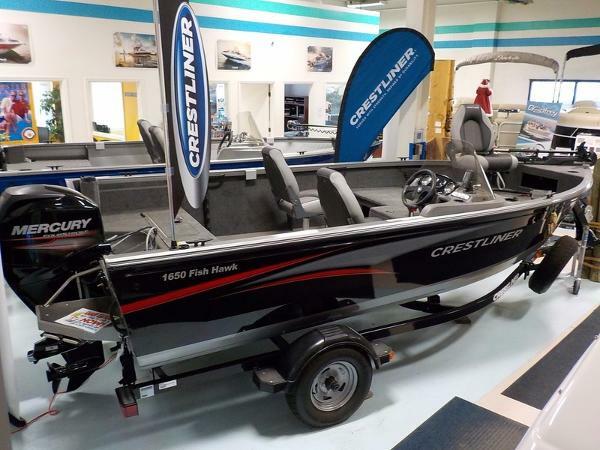 2017 Crestliner Fish Hawk 1650 SC 2017 1650 Fish Hawk side console Loaded with the Platinum edition which offers the 3D Crestliner Logo, flip up cleats, stainless steel steering wheel. Also has the conversion stern, gives you more room for fishing and then for relaxing fun. A Boss stereo. Trailer offers load guides and a spare tire with bracket, and has travel cover. Stop down and see us or give us a call for more information on this model or on one of the many others in stock. 2014 Crestliner Fish Hawk 1650 WT 2014 Crestliner Fish Hawk 1650 WT NICE 2014 CRESTLINER 1650 FISH HAWK WT WITH FACTORY ENGINE WARRANTY THRU 5/20/2021! 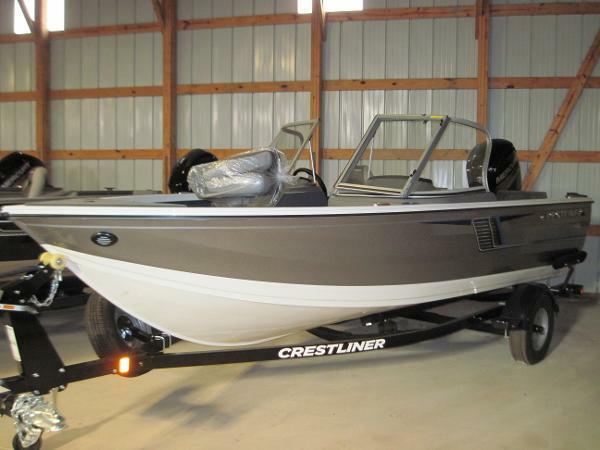 A 90 hp Mercury 4-stroke EFI outboard with power trim powers this aluminum deep-V fishing boat. 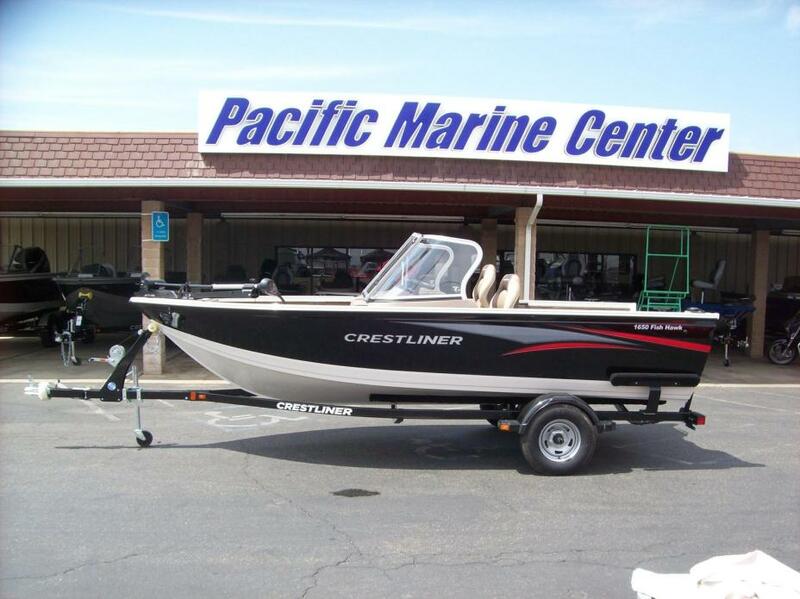 Features include: fisherman’s top, factory mooring cover, MinnKota 55 lb thrust PowerDrive V2 trolling motor w/battery condition gauge and removable bracket, Lowrance X50 DS fish/depth finder, Jensen AM/FM stereo w/USB and AUX inputs, dual consoles w/full walk-thru windshield and storage, passenger console glove box, gauges including; tachometer, speedometer, trim, voltmeter, and fuel; 12-volt power outlet, navigation/anchor lighting, bilge bump, raised bow fishing platform, bow glove box, (2) large in-floor bow storage compartments, large center rod box w/rod tubes and battery storage, (3) moveable swivel fishing chairs w/(6) floor bases, port rod storage rack, raised stern casting platform, stern storage compartment/battery storage, large stern aerated livewell w/manual and auto fill, stainless skeg guard, beverage holders, passenger safety handles, (4) mooring cleats, 6 person capacity, 20-gallon fuel tank, marine deep cycle trolling motor battery, marine cranking battery, and fire extinguisher. Also included is a ShoreLandr roller trailer including; swing tongue, swivel jack, 13” wheels, side centering bunks, composite fenders w/steps, bearing buddies, and tie-down straps. This package is in very good condition overall w/minor wear and only 97 engine hours. There are minor scuffs/scratches and stone chips on the exterior and side rails (see pics/video). Trades will be considered and competitive financing and delivery is available. Approximate payment is $178/mo. for 120 mo. with 20% down (WAC). Leaders RPM is one of the largest marine and powersports dealers in the Midwest with over 70,000 sq ft of showroom, parts, and service under one roof located in Kalamazoo, MI. Price is plus sales tax/fees and is subject to change without notice. 2014 Crestliner Fish Hawk 1650 SC 2014 CRESTLINER 1650 FISH HAWK SC SAVE THOUSANDS ON THIS NEW 2014 CRESTLINER 1650 FISH HAWK SC! This affordable fishing package features a Uni-Weld hull design with a limited lifetime warranty. The rest of the boat is covered by a 3-year bow-to-stern warranty and a limited-lifetime decking warranty. 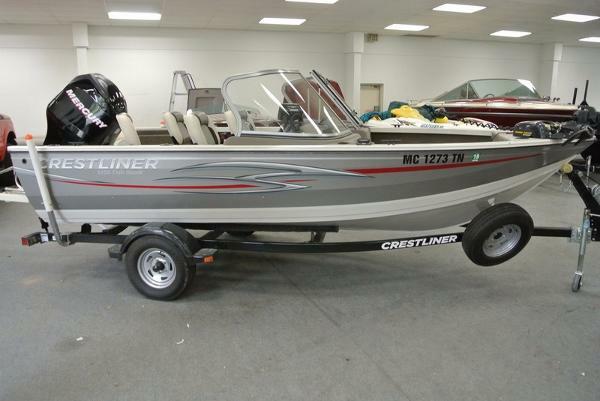 It is powered by a new 90 hp Mercury 4-stroke EFI outboard with power trim and a 3-year factory warranty. Optional equipment included in price: Lowrance Elite-3x fish/depth finder, vinyl cockpit flooring, third swivel fishing chair, and trailer side centering guides. 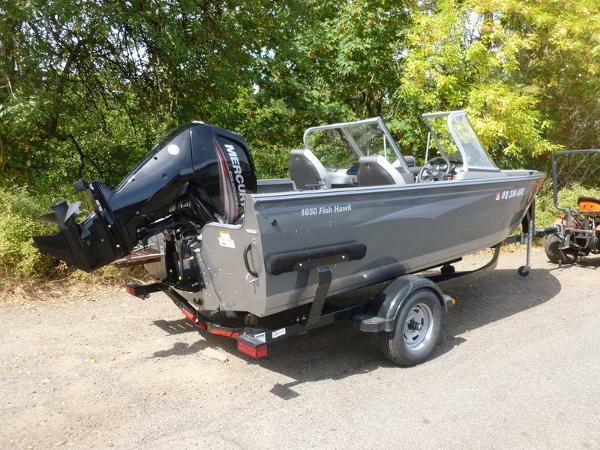 Features include: MinnKota PowerDrive V2 55 lb thrust trolling motor w/battery condition gauge and removable bracket, side console w/windscreen and storage, gauges including; tachometer, speedometer, trim, voltmeter, and fuel; 12-volt power outlet, navigation/anchor lights, bilge bump, raised bow fishing deck w/2 large storage compartments, large center rod box w/rod tubes and battery storage, bow glove box, (3) moveable swivel fishing chairs w/(6) floor bases, port rod storage rack, starboard cockpit storage, beverage holders, passenger safety handles, raised stern casting platform w/storage compartment/battery storage, large stern aerated livewell w/manual and auto fill, transom boarding ladder, (4) mooring cleats, 6 person capacity, 19-gallon fuel tank, marine deep cycle trolling motor battery, marine cranking battery, and fire extinguisher. Also included is a ShoreLandr bunk trailer including; swing tongue, swivel jack, 13” wheels, composite fenders w/steps, bearing buddies, and tie-down straps. Trades will be considered and competitive financing and delivery is available. Approximate payment is $199/mo. for 120 mo. with 20% down (WAC). Leaders RPM is one of the largest marine and powersports dealers in the Midwest with over 70,000 sq ft of showroom, parts, and service under one roof located in Kalamazoo, MI. Price is plus freight, prep and sales tax/fees and is subject to change without notice.